What Advantage is Activated Charcoal Treatment For a Cabin Filter? Cabin air filters improve the health of drivers everywhere by trapping contaminants, such as dust and pollen, providing clean cabin air to you and your loved ones. Cabin filters also help keep the air conditioning evaporator clean to combat microbe growth, which can lead to musty odors. Traditional, particulate cabin air filters are great. But there’s an even better type of cabin air filter: activated charcoal. Particulate filters are very successful at cleaning cabin air, but activated charcoal filters do even more. Not only do activated charcoal filters trap dust and debris, they also absorb fumes and odors. The charcoal found in cabin filters isn’t what you’d throw on a BBQ pit. It’s treated with heat and chemicals that allow for odor control. Gases are held on the surface of the activated charcoal filter by adsorption. Because it’s so porous, activated charcoal is extremely effective. Some of the gases controlled by activated charcoal cabin filters can be very harmful. For example, charcoal cabin filters absorb carbon monoxide and nitrogen oxide, both of which are serious health hazards. Activated charcoal cabin air filters may also have an anti-bacterial coated material. This prevents harmful bacteria from entering the cabin. Activated charcoal cabin air filters should be changed more frequently than traditional filters. Typically, charcoal filter replacements should take place once a year or every 15,000 miles. By comparison, particulate filters are generally replaced every 30,000 miles. Both filter types should be changed more frequently on vehicles that are driven in dirty, dusty, or high-pollution areas. Like all cabin filters, charcoal activated filters are easy to replace. Any DIYer can handle the task, and in most cases, tools aren’t required. 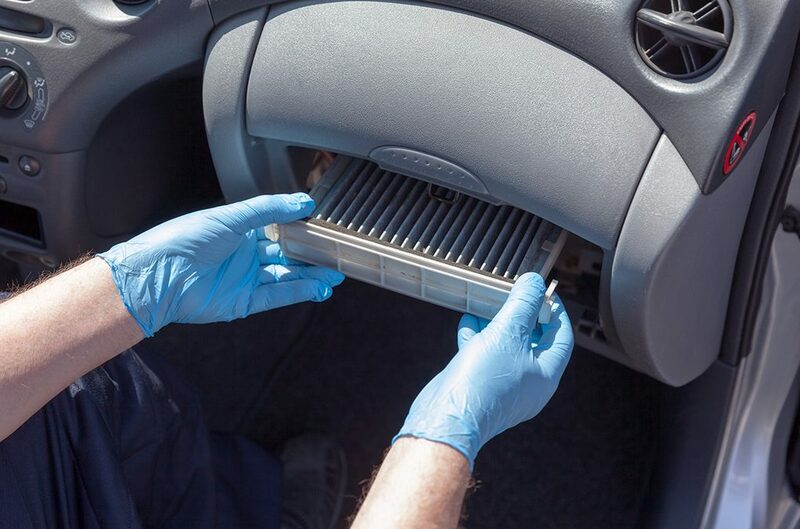 On many vehicles, the cabin filter is located right behind the glove box. Simply push the glove box tabs inward to pull the glovebox out. Then, push a couple more tabs to remove the filter cover. At this point, the cabin filter can be accessed and replaced. Some vehicles may have the cabin filter located at the base of the windshield cowl area. In this case, a plastic panel must be removed to access and replace the cabin filter. Either way, upgrading your current cabin filter to an activated charcoal filter is a simple task. On most cars, the job can be completed in under 10 minutes. Activated charcoal cabin filters typically cost more than particulate filters. But you will find it’s worth it the next time you’re stuck in traffic behind a large rig. A charcoal cabin filter can easily block diesel smoke, improving the quality of your daily commute. An activated charcoal cabin filter’s performance depends on the quality of the filter. Premium Guard cabin air filters trap up to 99% of airborne contaminants. Just like your home furnace filter, a good cabin air filter helps you breathe easy and promotes good health. Equip your home on wheels with the best – a high quality, activated charcoal air filter from Premium Guard.